"Miri" or basil is very appreciated in all the French Polynesia for its flowers and its nice-smelling leaves used on the preparation of the fragrant marquisian bouquet but also to decorate the ear or the hair. It is also part of basic plants for the preparation of "mono' i" (body oil), in particular to limit the rancid smell of certain traditional oil. It enters the traditional medications against the fevers and the lung infections. Essentially coming from western Asia then spread by the man all over the world in particular in all the Polynesian archipelagoes. This bushy ligneous plant can reach a height of one to two meters, in the nice-smelling leaves and white or pink flowers. It is essentially cultivated but can multiply by itself in gardens even in dry area such as the Marquesas Islands. bouquets call “Umuhei” which is mixed with flowers of ylang ylang and fara. The numerous virtues of the Miri enriched the Polynesian traditional medicine since the ancient times because it goes into the composition of certain medication very used by the Polynesian. 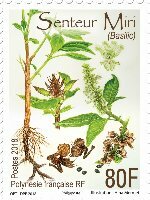 By rubbing slightly this stamp and smelling its fragrance, the Polynesian Post office invites you in a unique olfactive journey which can vary of the lemon in the cinnamon via the jasmine or the anise … Enjoy !